With a sharp rise in the use of internet connected devices, the demand for mobile-based applications has also escalated like never before. Especially, with today’s marketplace withstanding a radical transformation and all the favorable outcomes depending on providing a mobile app as one of their main channels, the chance for customer satisfaction has also manifolded to a significant extent. This is one of the most effective reasons why mobile application companies are on the leap and mobile application developers are so much in demand. So, keeping in mind the importance of mobile applications in today’s society, this post is going to discuss some of the top reasons the best mobile application development companies in USA are being contacted quite profusely. At the same time, taxi app solutions have come pretty much on demand and customers are moving to these uber like app solutions that provide amazing taxi booking experience just in a jiffy. When these taxi app solutions allow virtual interaction between the drivers and passengers, their quick mobility services also ensure top-end customer satisfaction. Thus, in order to take their business level to a new height, most of the taxi owners have adopted this new technology to take their taxi business to significant heights. According to a recent statistics, more than one billion smartphones have been purchased in 2016 alone. With mobile technology penetrating all the sectors in the market, consumers are becoming more mobile-oriented and in such circumstance, being into taxi business and not investing in taxi booking app development would perhaps be worst decision on your end. One of the advantages of mobile applications is that your existing customers can access your business from any location and at any time. Consumer’s regular usage of the app reinforces your brand identity and your business. This emphasizes the relationship that you can have with your customers through your app and is paramount in placing your business in your customer’s pocket. Mobile phones have made a deep impact on our lives and for many, it adds a personal touch. People always carry them around and use voice commands and personalized features to provide constant updates. This personal connection is possible due to the evolving app technology which allows complete access to the consumer’s data which when combined with demographic data and location gives wonderful insights into the behavior patterns of your consumers. As mobile devices permit geographic location integration, it collects information that could be pivotal for your business. Consumers are most likely to check out for service providers based on their location. It also prompts special offers and services which some mobile apps offer near you. The best mobile app development companies in USA have started integrating Location tagging features and are also formulating methods to make it more effective. Due to the ever-surging presence of consumers in the social media, in-app messaging can stir up the loyal customers to perform just as brand advocates. Just with a click, users can connect your app with almost any social platform and the integration is smooth and coherent. This has become even easier as geo-tagging options are provided. Now customers can share his or her location with almost anyone in their contact list. Websites always tend to take more time to load than that of a mobile application. But, when websites became more responsive, several business ventures felt that they had finally adopted the art of mobile culture, nevertheless, the advancement in custom mobile application development over the recent years has led to the evolution of the app technology which has completely altered user experience. For examples, customers can get an easy access who dine at restaurants can pay their bills with just a few clicks. To conclude, the mobile industry is thriving beyond the bar and as a taxi business owner, your investment in this particular section is quite inevitable. If you are yet to invest in mobile app development and not having second thoughts about it, then you must be lagging behind your competitors. The solutions to your nosedive taxi business loll in mobile devices only. Today’s modern technology has literally opened an array of doors before you to remodel your taxi business. Putting your money in a custom taxi company app would definitely take your customers’ experience to the desired level. 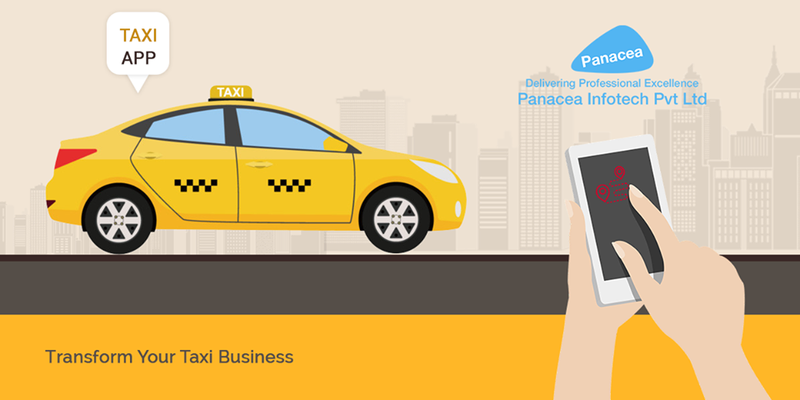 Panacea Infotech is a leading mobile app development company in USA offering a gamut of taxi app solutions that have just changed the life of a million of heads in a number of ways. The comfortable, hush and feature-rich addition of our uber-like app solutions ensure that your life is simple and hassle-free.